Papillon stars Charlie Hunnam as one of France’s most notorious convicts – and the country’s most famous prison escapee. 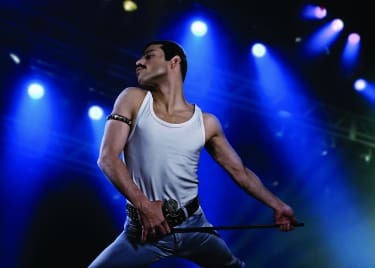 Hunnam’s character is based on the story of Henri Charrière, who earned the nickname Papillon for the tattoo of a butterfly on his chest, and who (he claims) was convicted for a murder he did not commit. Sent to one penal colony, he escaped and was ultimately sent to Devil’s Island. That’s the story, anyway, as recounted in Charrière’s book ‘Papillon.’ Over the years it has been contradicted, denied, exaggerated, and even claimed by other prisoners. But the concept of a determined prison escape artist can be bigger than truth, and we keep coming back to the tale. In 1973, Steve McQueen played Charrière in a film named after the prisoner. We’ll get to see Hunnam take on the larger-than-life character, accompanied by Rami Malek as another prisoner, when the new Papillon opens on August 24. Here’s the true story of Henri Charrière, or at least as much truth as we can dig out of his tales. Henri Charrière was born in southern France in 1906. He enlisted in the French Navy at age 17 and served two years. Soon he sated his desire for adventure by falling in with Parisian gangsters. His criminal activities were the stuff of stylish movies, as he robbed and stole, and cracked safes. There are stories that Charrière also worked as a pimp, and the connection to that criminal circle would ultimately define his life. The gangster was arrested for the murder of another pimp, Roland Le Petit, in 1931. Charrière professed his innocence, but his words fell on deaf ears, and he was convicted and sentenced to life imprisonment. In 1933, Charrière was transported to the prison of St-Laurent-du-Maroni in the penal settlement of the French Guiana. There, the new convict’s restless, daring nature took over just as it had when he dove into the criminal underworld. Like the free-floating creature inked on his chest, the so-called Papillon decided to escape. Conditions at the penal colony were horrendous, but Charrière didn’t plan to stick around. His first escape attempt was in November 1933. Charrière was joined in that effort by two other prisoners, André Maturette and Joanes Clousiot. The three escapees ended up in a leper colony and bought a boat from the colony leader. They sailed for weeks, attempting to reach Colombia. They almost got there, but just off the Colombian coast the group was spotted and arrested. Imprisoned again, Charrière soon managed to escape once more. Still in Colombia, he fled to the La Guajira Peninsula, which is the northernmost point in South America. There, he was sheltered by a native tribe. In his book, Charrière explains that despite being wildly happy on the peninsula, he wanted to clear his name, and so headed west, towards a city where he could return to France. He didn’t get very far. Less than 100 miles from the village where he’d been laying low, Charrière was captured again. Reunited with fellow escapees Clousiot and Maturette in a Colombian prison, all three were soon sent back to French Guiana. They were sentenced to two years in solitary confinement. Over the next eleven years, Charrière would make many more escape attempts. He faked insanity to help with one. His friends died in prison, and some accomplices were killed in attempted escapes. According to his book, Charrière actually requested to be transferred to the notoriously inescapable Devil’s Island prison camp. Naturally, Charrière was able to free himself even from Devil’s Island. That wasn’t quite the end of his journey, but after one more stint in prison, he was able to live as a free man. He settled in Venezuela in 1945, married, and opened a restaurant before eventually returning to Paris. While Charrière claimed his novel was about 75% true, it is now accepted that much of it may have been fictionalized. French penal colony records indicate that Charrière was never sent to Devil’s Island. Other former prisoners have said elements of the book are their own stories, told to Charrière over the years. 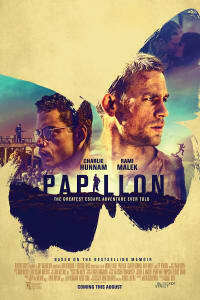 In 2005, a 104-year old former convict and French war hero claimed most of the stories in ‘Papillon’ happened to him. Charrière was pardoned for Le Petit’s murder in 1970. Around the same time, the ex-con played a thief in a crime movie. He was on set as events in his novel were turned into the 1973 film Papillon, which starred Steve McQueen as Charrière. The man known as Papillon died of throat cancer just a few months before the film premiered. The new Papillon, directed by Michael Noer, opens on August 24th, 2018.